So, I’m not the most frequent blog poster. In fact, I should probably do better with that. 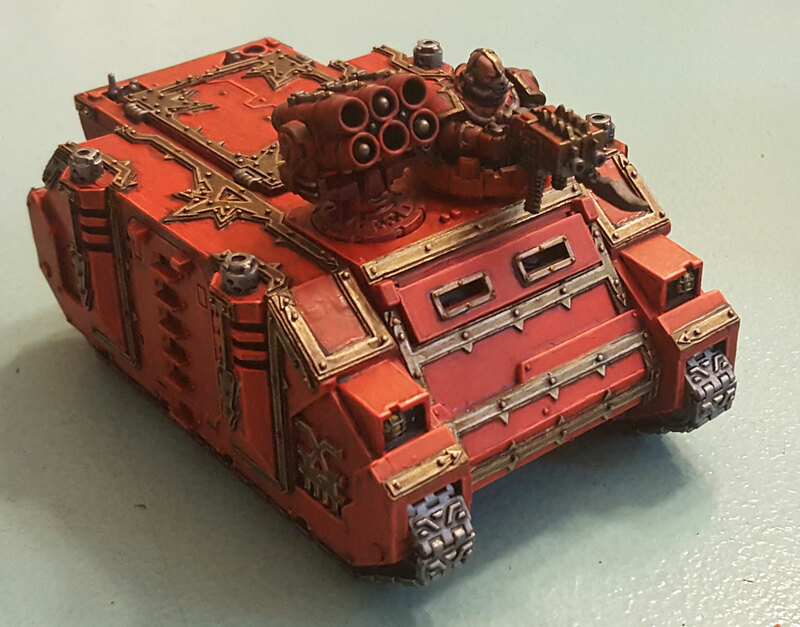 But in the meantime, I’ve been working on my Chaos Space Marine Rhino for my Khorne Daemonkin. I know, I know – why am I doing anything with KDK as it looks like they may not translate to 8th edition? I’m actually hoping to get the army finished before the new edition actually drops. And one of the three units left is nearing completion. Here I’ve used what has become my standard Khorne Daemonkin paint colors. Even my method is pretty formalized. The one change is that after the Nuln Oil wash, I used another thin coat of Evil Sunz Scarlet. I think it works well on the more standard vehicles vehicles, which have more flat surface area. Just leaving the scarlet coated with the wash was too dark. I also did some edge highlighting with the Wild Rider Red.